After what could be considering a snoozefest in Abu Dhabi, we're hoping for better from Formula One this weekend. The Circuit of the Americas should be able to deliver, although we only have one year of data to base that on. The drivers seem to like the track though, and the reception from the crowd is always brilliant. With just two races left before the season end, how will the penultimate weekend pan out? There's not an awful lot in the championship to be fought for, which just eases the pressure on most of the drivers. We've got Heikki Kovalainen in at Lotus, after Kimi Räikkönen's early exit from the team. There are also a lot of other changes being announced for 2014, leaving a lot of teams with tricky relationships to try and manage. With that, the epic track, and the end-of-term feeling that's hovering over the paddock, there could be an awful lot of fun in Texas this weekend. Support racing for this event includes Ferrari Challenge and Formula Vintage. The natural state of Texas is all about hot weather, but it is November and last year the temperatures were cooler than most were anticipating. This year looks set to deliver something similar, with rain forecast for Thursday and Friday, clearing up for the weekend - although there are still predicted to be plenty of clouds in the sky. We have double DRS again this weekend, and you can guarantee there will be some overtaking action down the enormous back straight. That is the first DRS zone, with detection ahead of the hairpin, and then activation at the start of the long stretch of track. The second zone is for the start/finish straight, with detection coming before the final corner and activation down the home stretch. It ends before the drivers get to the menacing turn one, as you wouldn't want to run DRS open through there! The Circuit of the Americas runs anti-clockwise and is what you might call a selection box of the best corners from the rest of the calendar. Unashamedly borrowing from Silverstone, Hockenheim, and Istanbul, there is a lot packed into the 5.5 kilometres of tarmac. The first corner is the most iconic, and the most challenging, with a steep incline leading to sharp, blind left hand hairpin. A sequence of winding and twisting corners leads to the hairpin at the other end of the circuit, which in turn leads on to the enormous back straight. 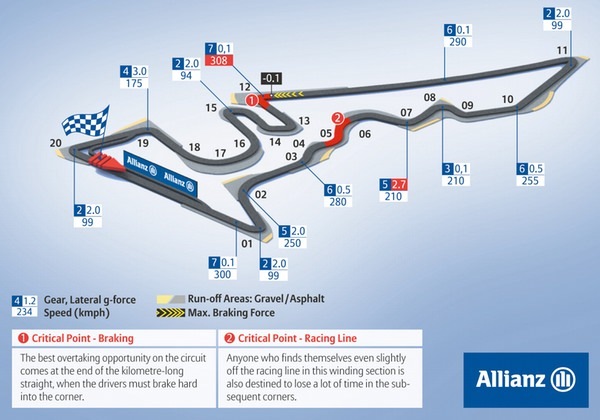 Ending abruptly with a few sharp turns, the track leads round to a multi-apex bend that echoes Turn 8 in Turkey. A few more ninety degree turns lead back onto the start/finish straight. There was no sign of a safety car during the 2012 race, so working out the chances of there being one this year is slightly harder than normal. Top speeds reach 314 kilometres an hour, whilst the speediest pit stop was 2.6 seconds. Last year, the racing in Austin delivered one pit-stop strategies, but Pirelli are hoping to change that. The hard and medium compounds have been used for both outings in Texas, but this year the softer compounds are expected to encourage more visits to the pit lane. 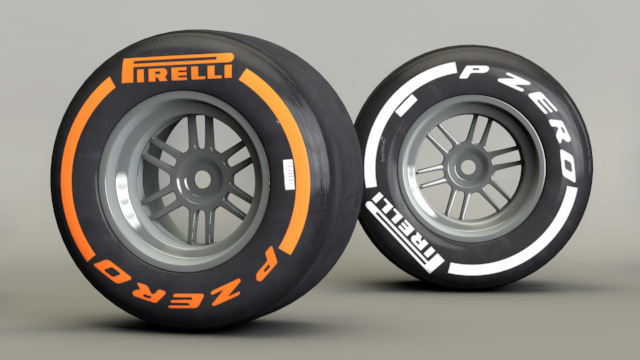 Pirelli also believe the rubber will more durable around the demanding track, but as mentioned before, the lower temperatures could be an issue. It's a circuit that places several high-energy demands on the tyres, so you need the most durable compounds in the range. There are some fast corners and many rapid elevation changes as well: in that respect it's a bit like Spa. Nigel Mansell Formula One World Champion 1992, CART Champion 1993, Le Mans driver and President of the Institute of Advanced Motorists.